KANSAS CITY, Mo. – The Kansas City Chiefs will open the 2018 preseason on Thursday when the Houston Texans visit Arrowhead Stadium for a 7:30 p.m. matchup. The game will be broadcast locally on KINA and 99KG, both a part of the Chiefs Radio Network. The “Voice of the Chiefs” Mitch Holthus, former Chiefs long snapper Kendall Gammon, and sideline reporter Dani Welniak will have the call. KINA and 99KG will carry the pre-game show at 6:30 p.m. and the game at 7:30 p.m. The post-game show will air on KINA following the game. According to a news release from Chiefs.com, fans can find important information and reminders about Thursday’s game below. Thursday marks the 34th annual Chiefs Charity Game. Recognized as the top philanthropic game of its type in the NFL, it continues the club’s long-standing commitment of offering vital support in the local community that was started by team Founder Lamar Hunt more than three decades ago. Since its inception in 1985, the Chiefs Charity Game has raised more than $13.3 million, with more than $6 million being raised in the last decade alone. Last September, the Chiefs announced that Cornerstones of Care will be this year’s beneficiary. Dating back to 1871, Cornerstones of Care has a long legacy of partnering with children and families to create safe and healthy communities. Annually, Cornerstones of Care serves more than 7,000 children and families through education, mental & behavioral health, foster care & adoption, youth & family support, and community trainings in Kansas, Missouri, and beyond. The 2018 season will be the first with Cornerstones of Care as the beneficiary. The Hunt Family Foundation 50/50 Raffle will also benefit Cornerstones of Care, so all fans who attend Thursday’s game will be able to support this cause. All fans are reminded that there will be increased traffic throughout the city for Thursday’s game due to the outbound rush hour commute. Fans may experience delays and traffic congestion that they might not normally experience for weekend contests and are therefore encouraged to plan accordingly. Making its debut for the 2018 football season, the reimagined Ford Tailgate District will be open to all fans for game days this fall. This free space, located in Lot M near the Founder’s Plaza on the north side of the stadium, will feature drink specials, food trucks and live entertainment throughout the afternoon. The Ford Tailgate District will be open at 3 p.m. and will remain open until kickoff. Parking lot gates for Thursday’s game open at 2:30 p.m. Fans are encouraged to purchase their parking passes in advance to decrease the time spent at parking tollgates and help expedite the parking process for all gameday visitors. 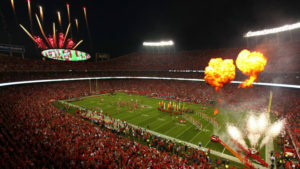 Parking passes can be purchased in advance for $35 at the Chiefs Ticket Office or online at www.chiefs.com/parking (with applicable Ticketmaster fees). Cash parking is $60 at the tollgates. All Arrowhead Stadium gates will open at 5:30 p.m. for the 7:30 p.m. kickoff. Gates for guests with tickets on the Scout Investments Club Level will open at 5 p.m. The Liberty Belles will perform Thursday’s national anthem while the Smith Cotton JROTC Color Guard presents the flag. The Liberty Belles are Caroline Kellam & Avery Ellis, high school juniors out of Frisco, Texas, who have performed the national anthem across professional and college sports over the past four years. For more Chiefs content follow the Kansas City Chiefs and Matt McMullen on Twitter.